When I feel it is time, I will take a call. It is going to be a tough call nevertheless. It is going to be tough because this is what I have been doing all my life. It is going to be difficult to suddenly hang up my boots one day. I have the highest regard for Tendulkar, but somebody please give the man a copy of Who Moved My Cheese? Domestic resource mobilisation, though central to the process of Indian economic growth, is characterized by several constraints. Explain in ten words. One little-noticed wrinkle in the recent failed no-confidence motion is that it serves as 'inoculation': no other such motions can be brought up against the government for the next six months. Watch out for attempts to push through more audacious policies/legislation, without any worries about the government falling because of such attempts. For such joy leads to contentment with slaughter. Cannot find fulfillment in the world. Something entirely lost on these joyous folks. Contrast this with the reaction of Major Unnikrishnan's father. I think I've said this before, but will say it again: the best way to decide whether somebody gets the death penalty is the Arab/Shariah custom of putting the question to the victim's family. Needless to say, this is not a pardon, but only to decide whether the murderer is put to death or spends the rest of his life (life; not 14 years commuted to 10 on account of Gandhi Jayanti, good conduct, and so on) in prison. Let's clear this up again. The ECB is going to buy bonds of bankrupt banks just so that the banks can buy more bonds from bankrupt governments. Meanwhile, just to prop this up the ESM will borrow money from bankrupt governments to buy the very bonds of those bankrupt governments. Another interesting tidbit from the report: the demographics are so bad in Japan that they actually have adult diaper fashion shows. [H]aving the career of the beloved CIA Director and the commanding general in Afghanistan instantly destroyed due to highly invasive and unwarranted electronic surveillance is almost enough to make one believe not only that there is a god, but that he is an ardent civil libertarian. Having just completed the machine learning course in Coursera, time to put the knowledge to good use. Neural networks seem to be the most promising among the classification algorithms (logistic regression and SVMs being the others covered in the course) -- I did do bit of mucking around with logistic regression, but the results were singularly disappointing. We use one hidden layer with five activation units -- could've used more hidden layers, but the code I wrote for the course assignments is for a single hidden layer, and I'm too lazy to bother to make the code more general. Not to mention that the efficacy of using more layers is moot. The examples are a total of 560 matches from the 2010-11 and 2011-12 seasons (we ignore the first few weeks of each season to a) get things to settle down and b) avoid division-by-zero errors for some of the features (e.g. when we're considering the first match a team plays in the season). 350 matches are used as the training set and 30%, i.e. 105, from the remainder form the cross validation set. After a lot of number crunching, the results are not too good, at least not yet. 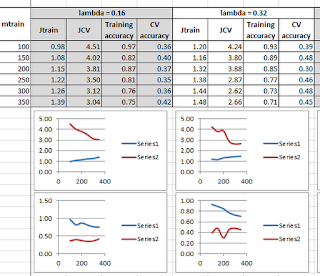 It looks like I'll be needing more data (as indicated by the results from the learning curve plots). A lambda value of 0.16 or 0.32 seems to be the most promising. The next step is to get the results for the 2009-10 season -- and earlier if required. More grunt work. Stay tuned. 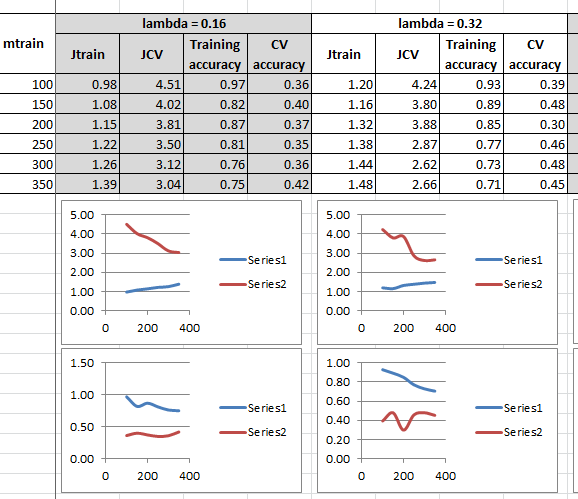 Update: Well, I went all out and got the results for three seasons -- 2007-08, 2008-09 and 2009-10 -- but no cigar; the prediction accuracy refuses to go above ~50%, whatever values of lambda and feature list I consider (I added two more features to the above list: total games played so far by both teams). It might be possible to squeeze out a bit more by running a genetic algorithm and figuring out the best lambda value and features, but I don't think the effort is worth it. Question: what is the minimal prediction accuracy required to get a 20% return on bets over the long-term, e.g., over an entire season? "After hundreds of drone strikes, how could the United States possibly still be working its way through a 'top 20' list?"